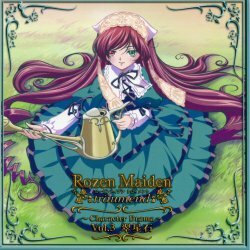 The third installment in the Rozen Maiden Character Drama series, with a 10/25/2006 release, stars fan-favorite Suiseiseki. The events in this drama appear to be placed shortly after the fourth episode of Träumend and deal with Suiseiseki's attempts to adjust to the Sakurada household (and vice-versa) after having made her new contract with Jun. Perhaps I've become jaded (pun not intended) from reading too many doujins and fan-comics about her, but it seemed that the story here proceeded in a very predictable manner. Nevertheless, there were some cute and funny moments to it, and since Suiseiseki is love, more of her cannot fail to be a good thing. Next month's CD focusing on her twin sister should hopefully be interesting, since we didn't get to know Souseiseki very well during the TV series. Download a plain ASCII version (*.TXT) of the entire script here (27 KB).